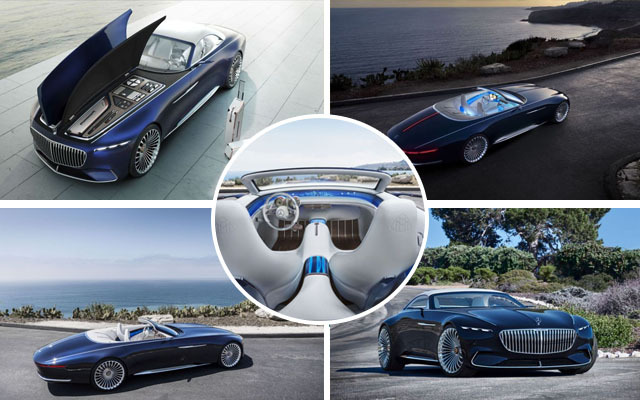 Mercedes-Maybach 6 convertible concept, a new version of the previously unveiled Maybach Vision, just debuted. It is a two-seater cabriolet with so much luxury to offer. Surprisingly, this road fortress is all-electric with a length of 20 feet and a whopping 750-horsepower. It is said to have a range of more than 200 miles on a single full charge. The open-roof Vision 6 cabriolet features same specs and engine like its predecessor. This is just another of Mercedes’ dream of how its cars would take a likely form in 2035 and beyond. Instead of an engine in the hood at the front, there are only spacious vacuums for storage of luggages since it is an electric car and doesn’t need the heavy, space-consuming mechanical running parts. However, according to Mercedes, the Maybach 6 Cabriolet will have the capacity to reach 0-60 mph in just about 4 secs, and have a maximum speed of 155 mph. A newer super charger has been developed by Mercedes which will allow the car charge faster and can go about 60 miles just after 5 mins of charging.The hood opens like a butterfly wing, revealing suitcase and luggage sections. With 24-inch alloy wheels and a very high-tech design, the Vision 6 convertible is a representation of pure elegance, beauty and grandeur. Sadly, Mercedes says it won’t go into full production as it would remain a concept for now, but there is a possibility it could be produced in the near future. So don’t expect to buy it anytime soon. It’s for your eyes only.